WIth the Stanley Cup starting this week (can it be mid-June?) I was recalling an evening in April when my son and I joined another father and son at a NHL game. Great seats. Big excited crowd. Right before the game the arena went dark. The rock n’ roll lighting show began and speed metal pumped through the speakers to set the tone. Then came the charm of the Canadian National Anthem and the power and glory of The National Anthem. 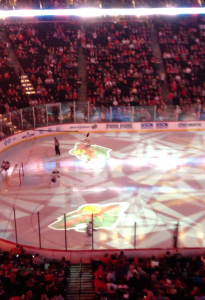 As a prelude to the first period, a music video played. It was our home team’s theme. Starting as a bit of an Irish folk song then switching into a rollicking sing-along that was all about the local love for hockey and its deep legacy. Why don’t more businesses have a theme song? I mean really. There are missions, positioning statements, core values etc. Most with no memorable value whatsoever, except maybe for the consultant who got you to buy it. Please don’t get a theme some confused with a jingle. A jingle helps customers remember your brand or a unique element of it by blending lyrics and music in a memorable way. Well maybe Pavlovian way is more accurate!. And jingles can be effective. But a theme song needs to be grander and motivating. Think of a hymn or even a rallying cry. And a theme song doesn’t need to be an original song like the NHL team I heard. You can rally around any kind of song. So what’s your theme song going to be? Hey there! I’ve been following your blog for some time now and finally got the courage to go ahead and give you a shout out from Austin Texas!